At the age of fourteen Munnings was apprenticed to Page Bros., a firm of Norwich lithographers where he spent the next six years creating poster designs and advertisements for Caley's chocolates and crackers, Colmans Mustard, and Waverley Cycles. The latter won an advertising poster competition. In his memoirs, Munnings writes that he could never create poster designs with ease and he brought work to Page Brothers that 'had never been done before' (An Artist's Life, pp. 81 and 76). His work was so novel that Caley's director procured freelance poster work from the young Munnings long after he resigned from Page Brothers. These works were not only so sought after that they made Munnings financially secure, but they set the precedent for decorative chocolate-box tops. Although it is unknown for what this poster design was used, it was most likley for Caley's Chocolates. 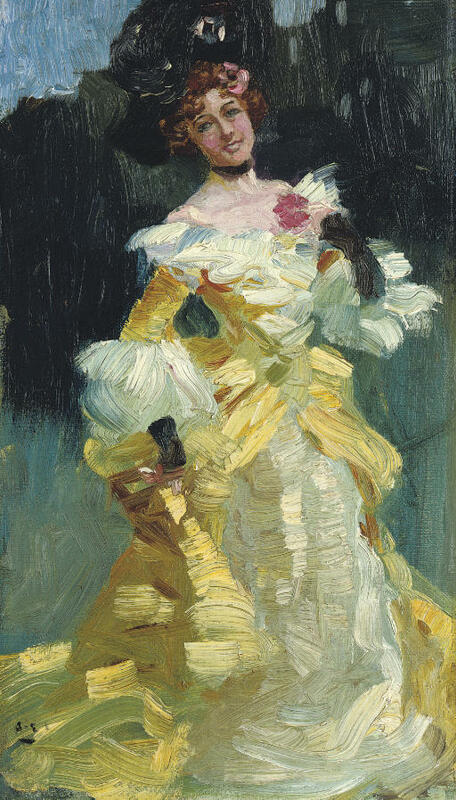 Munnings often used May, a dark-eyed, dark-haired cousin and a friend as models in frilly costume dresses and large hats, one of which won Silver Medal at the Crystal Palace in 1899 (see An Artist's Life, pp. 96-97). This work illustrates the immediacy and deft directness with which Munnings used his brush. It displays a confidence and bold sense of design characteristic of all his work and a techical assurance that later enabled him to capture open-air effects. We would like to thank Lorian Peralta-Ramos for her help in preparing this catalogue entry. The picture will ve in the forthcoming catalogue raisonné of the artist's work.